It would bring a lot of attention if you have laser cut screen doors for your house or office, people can see it when they pass by your house. Not only add the decoration on the daily use stuff, but also show the passion and the love to life. It is the thing that makes you different from others. And for the company using the laser cut screen doors want the door say something about them. Normally the design studio, the advertising companies like to use the laser cut doors. People would feel the creation and the enthusiasm when they see the door. The laser cut screen doors must have low density, otherwise people cannot see through it and it is not a screen door anymore. The designers and users need to note about this and choose the right pattern. Normally there are glasses of the laser cut screen doors. The laser cut metal panels’ edge is sharp and people may get hurt if there’s no protection. In additional, the tempered glass is able to prevent the dust and the insects. It can be very modern and fashion for the laser cut screen doors used in office. Unlike the house, one single door is enough. Optional colors on laser cut panels and the locks are available for the doors. 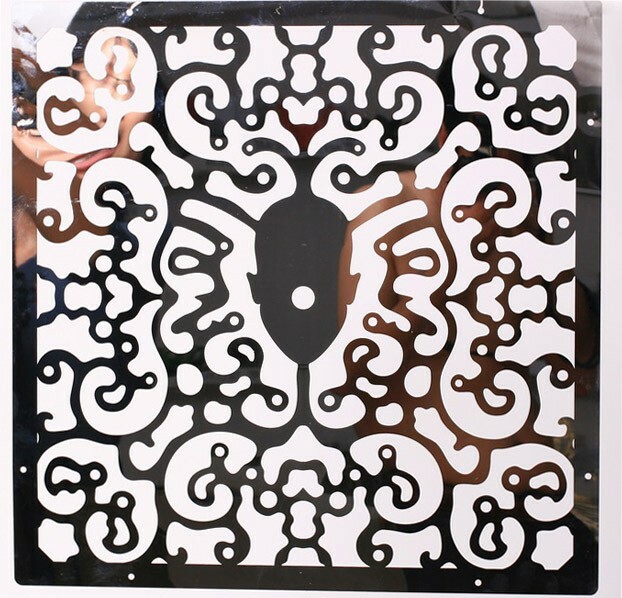 The laser cut architectural screens is the favorite product that the engineering company like to do. After all the big guy in the decoration world would contribute a lot of business turnover. To some degrees the laser cut architectural screens is not a screen or a piece of furniture anymore, it is the part of the project like the curtain wall. The entire building could be covered by the laser cut architectural screens completely if you want. We can see the decorative metal panels used as the curtain wall to wrap the building, or the laser cut architectural screens used as the wall to cover the balcony, cover the corridor, shelter the yard, etc. Considering the outline dimension is too large and there is no single panel can meet the requirement, the splicing is common in the production of the laser cut architectural screens. Normally the panels spliced by welding. It needs to care about the strength of the joint position where the laser cutting would be made. Pattern of plants are popular on the laser cut architectural screens, trees, branches, rattan, leafs, etc. The abstract or the geometric is not used a lot, otherwise it would be too dense and dazzling, especially on the outdoor use large size metal panels. How hard to make your own laser cut screen art ? People try to design his or her own laser cut screen art because besides the designing cost it is difficult to communicate with the designers just like the hairdresser never understand the clients’ needs. The DIY’s advantage is you can get exact what you want of the laser cut screen art. But most ones would take it as a hard job. Yes, it is difficult because you don’t how to do at all. Don’t what you need to get before start; don’t know which software to use or should learn. As same as a rookie trying to do the professional stuff. Let’s get started by learning. Get some photos of the laser cut screen art you like the most, then try to image the pattern you want to make in mind, and try to draw the pattern by hands during the imaging. You will make progress after practice. Try some other styles later when you are familiar with your favorite ones. What next is to use the computer software to make your hand drawing of the laser cut screen art become digital. You can try to learn the software by yourselves or have a training course. All the software is easy to learn, just need the time to practice to become skilled. To some degrees, it is easy to do the laser cut screen art, after all it is the 2d designing only. What’s the use life of laser cut screens outdoor ? There are material options of carbon steel, Corten steel, stainless steel, aluminum for laser cut screens. We all know the stainless steel and the aluminum has long life in outdoor, they can stay for at least 5 years if the place is not close to sea or the other corrosive environment. The Corten steel ? It is born for outdoor, it can have 10 years without surface finishing. The carbon steel needs to be cared about in outdoor. The stainless steel or the aluminum has the special use for outdoor, for example the company name, the light box, sculpture, etc. But they are not suitable for yard fence for garden screens, because the surface is too smooth, it may reflective the light and make it shinning in sunshine. And they are too modern, it needs be more natural of the laser cut screens outdoor material, otherwise it conflicts. The surface finishing not only add the decoration but also provide the protection which would increase a lot of the life for laser cut screens. There are zinc plating, painting, powder coating for carbon steel. Zinc plating is the most common way but it is not good looking, only suitable for the functional parts. There are color options of painting and powder coating and it can protect the steel pretty well. We believe the carbon laser cut screens for outdoor can last 5 years if there is good protection and maintained. The alternative name of Corten steel is weather resistant steel, the material property can last long in outdoor. So many outdoor building made of corten steel, for example the track rail, the metal sculpture, curtain wall (e.g. 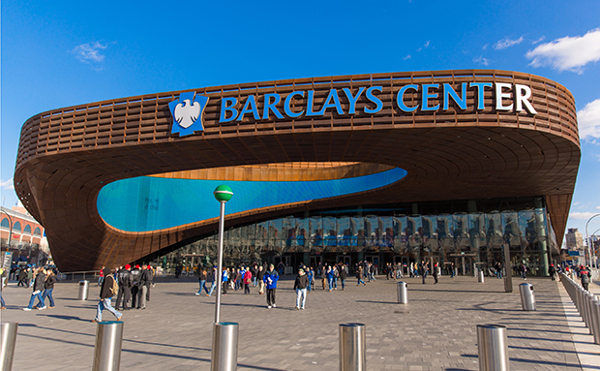 the Barclays Center). 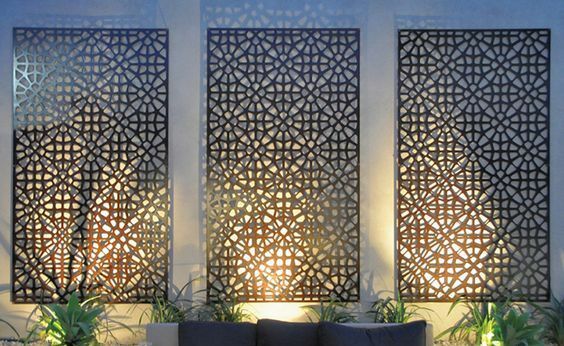 Suggest use the corten steel for laser cut screens outdoor use, it lasts long time. And if you do the proper maintain, it is rust resistant forever. Sales and marketing is the eternal topic, even us the factory and trading of laser cut screens also think about the new ideas, new ways for this rapid developing information times, so we build the English website, the facebook page, twitter, and we are thinking about adding the online store page. Above we talked are the new marketing elements of this era. They are like one kind of fashion and they are working really good. It offers the platform where the seller and the buyers can communicate and fans can discuss, attract more attention online and make it much easier for mobile device users. All of this is the power and the convenience of the new media. The industries and the products are different from one another, and the ideas need to be unique. For the traditional heavy industry, I agree the new media can bring the traffics but most deals done offline. This is the so called O2O, online to offline. Okay, let’s get back to our topic to get some new ideas of the sales and market of our own product: the laser cut screens. We think the online store is suitable for laser cut screens even it is very customized. It will be easy and convenient for clients to make the decision, they just need to choose the pattern, set the dimensions. The developed shipping system and method will decrease the cost and increase the convenience. As the supplier of laser cut metal screens, we are thinking about a little bit more than the designers, we need to figure out the way how client would fix the screens and provide our suggestion on structure, try to make it more reasonable and make it easy for clients. How do you fix a flat metal panel? If you plan to hang it or fix it on the wall, just need to do some holes on the side of the panel, it is easy. The most common situation is client would like to put the laser cut metal screens vertically so that people can see the complete pattern. In this case the panel cannot be flat, unless you are able to bury it on the ground or concrete, which is more complicated and difficult. In this case we would do the bending of each side to form the folded edge, and drill holes on the folded sides; it would be easy to fix the screens with the ground or ceiling by anchor screws through the holes. And we can connect the panels together by screws through the side holes. Some clients like to fix the metal panels on the rail and post; the side holes are helpful as well. Besides, the folded edges will make the panel strong. Image what would happen if you put a large size panel vertically, yes it would be very weak even it is fixed. It would be much better if there are folded edges; it is like add the frame or post on the panel. 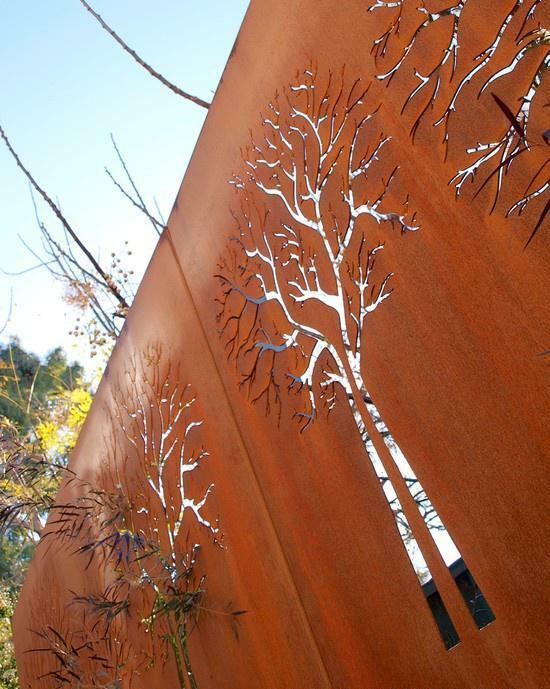 The Corten steel is the best material for outdoor use laser cut panel. It is one kind of low alloy steel has good weathering resistance ability, in short, it has much longer life in outdoor. 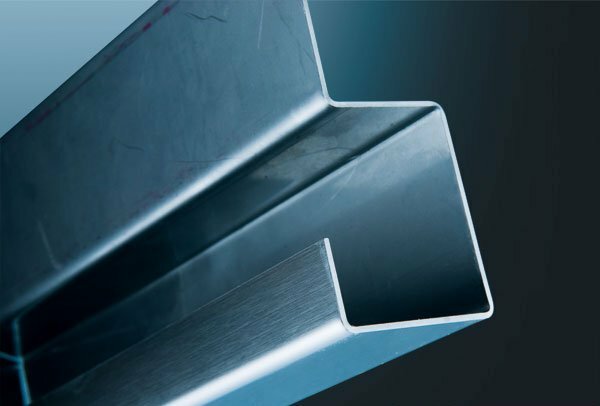 It has 2 to 8 times use life than the normal steel and it’s up to 10 times after coating. Rust is the cancer of steel, no one want their laser cut metal panel disappeared in short time. 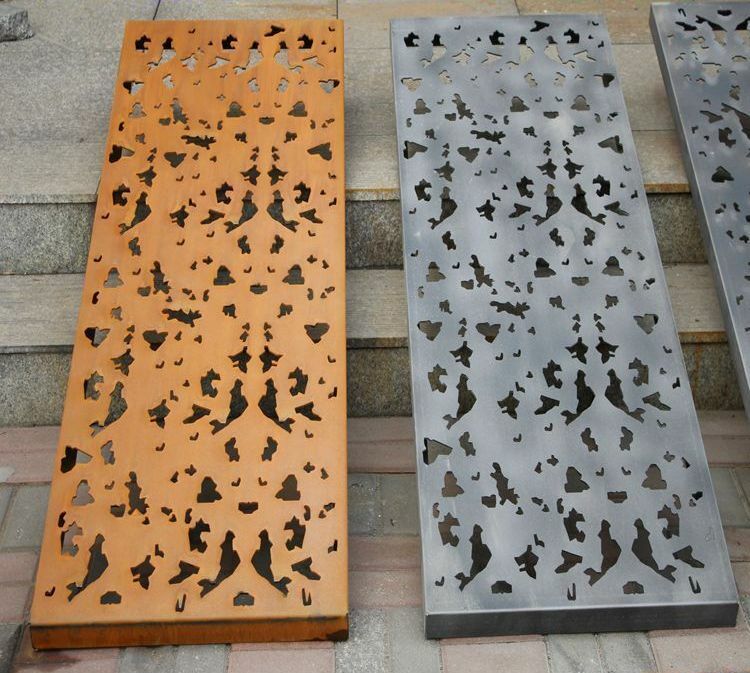 If you plan to put the laser cut metal panels in outdoor, suggest use the Corten steel. There are many kinds of use for laser cut metal panels, signs, garden screen, yard fence, gate, etc. You have to consider the rust problem for the outdoor use products, yes we are able to do the protection like painting, powder coating, plating on the surface for decoration and protection, or we can change a way to use the Corten steel. The production method of the laser cut Corten steel panel is same as other material, just no need to do the surface finishing. The original appearance of the Corten steel is quite similar as others, the color is a little darker, but when it get rust, it would be very different. Normally we suggest keep the original surface of the Corten steel and let it get rust slowly. The reason is the rust color of Corten steel is changing, which is another kind of decoration; also it saves the cost of artificial rust. Now the steel price is dropping, and the Corten steel price is much cheaper than before, please don’t hesitate to have a try of Corten steel if you plan to do some laser cut metal panels. You won’t regret it ! 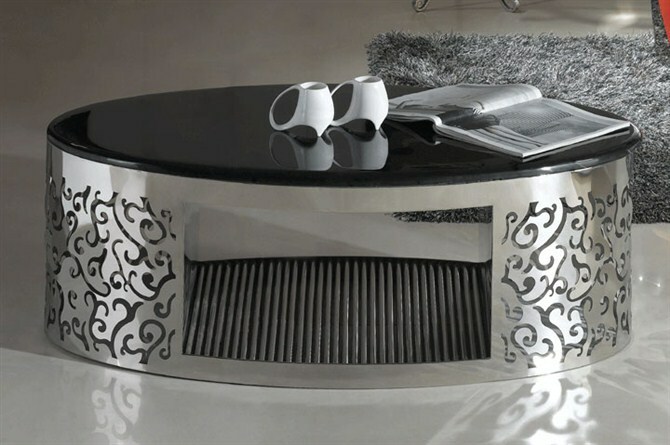 Have you ever thought about using the stainless steel coffee table in your shop or living room? It is unlike the traditional wooden tables in coffee shops, the wood table with simple design and varnish surface, but stainless steel coffee table has its own special feature and style which would create the unique atmosphere when you enjoy the leisure time. Speaking of the stainless steel coffee table, it does not mean all the parts of the tables will be made of stainless steel. The most common design is using the stainless steel to do the leg or base at the bottom as the support of the table, using the other material like marble, solid wood or fabric as the top, just like the other stainless steel furniture. People will put the coffee on the table and people may touch the table surface, so the other materials have better touch feeing than metal material. Although, the stainless steel coffee table has its own features. Modern and the decoration are the two main features. The metal expresses the unique clean, neat, and strong feeling, has strong period feel, which is more suitable for the modern coffee shops, the hotels and restaurants. Also there is a lot decoration space on the metal part, the design patterned can be cut on the metal, and it can be the logo or name of the coffee shop, the view or the abstract designs. Besides, the legs of the stainless steel coffee table can be designed in many creative structures, round, square, triangle, etc. as long as you like. So far there are not many chain stores using the metal coffee tables, maybe it is more popular and suitable for the thematic shops and personal house. Imagine put a stainless steel coffee table in your living room, drink a cup of coffee you like while reading, what a style! Also the coffee table can be used as the tea table or side table as well. 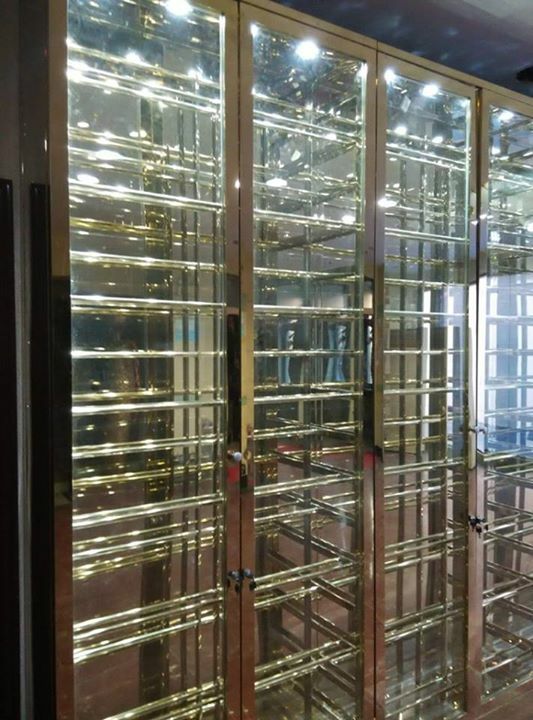 Nowadays more and more people know, accept and like decorative metal screen, it looks this product is popular and there is business opportunity all around the world. 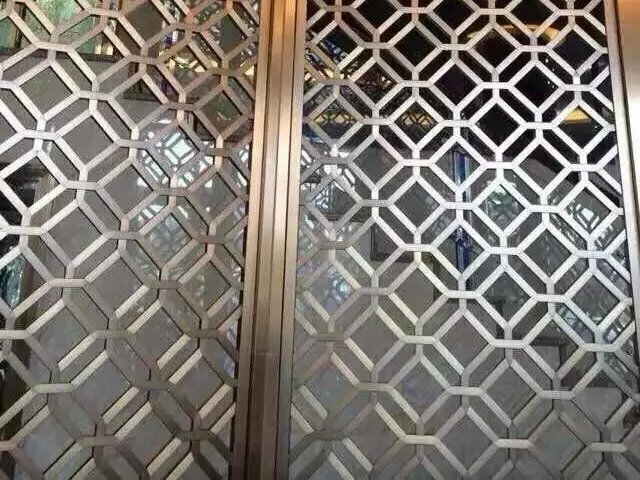 So we started the exporting business of the decorative metal screen, what we find out is that this product has its own specialty in exporting and using, it has strong territoriality, which means people may like it very much in some place while in somewhere else it is not that attractive. The most obvious point is the popularity depends on the climate very much, people in tropical regions like the decorative metal screen very much while people in the cold regions don’t have much need of them, and even the region has strong purchasing power. And guess what, it has the same situation in our domestic market; the decorative metal products are popular in hot provinces and the cold places do not have the big need so far. What we have discussed is that the decorative metal screen gives people the cold feeling, it would make people feel cold or it reminds people of cold. Because of the material feature, metal feels more cold than wood. Imagine in summer of tropical region, people likes to sit in the room with the cool air conditioner, the decorative metal screen would increase this fresh cool feeling; while in winter of cold region, everything looks cold even in the room with fireplace, people prefer to use the wood rather than metal to do the furniture or the other products in room, and the summer in these places is short and not that hot. What we learnt is there is big demand of the decorative metal screen in the tropical areas like the Southeast Asia like Thailand, Malaysia, south Asia like India, and the South America countries like Brazil, Argentine, Chile, etc. and the Africa, especially North African countries. But for the traditional importing countries clients prefer the wood products, there are needs but it is not as big as expected in the case of their strong purchasing power. So colleagues, if you are looking for the business opportunity of decorative metal screen, pay more attention to tropical regions. Using the metal wine rack to display and store the wines are more and more popular, we’ll find the sellers would use the metal wine rack to show their wine products when they are doing the promotion on fair, TV or the online video. Also, the restaurants and the hotels like to use the metal wine cabinet to store the red wines in the dining room. We’ll introduce the features and the advantages of the metal wine rack. The basic advantage of the metal wine rack is that the metal won’t crack, get moldy or moth eaten by the wet environment or the insects. Yes, the traditional wine shelf would use the good wood material to prevent the above possible problems. But if use the metal ones, you don’t need to worry about this at all. Some clients like to store the wines in the basement where is dark, wet and unventilated, would be much better to use the metal wine racks. In additional, the metal wine rack is more modern. Normally the metal wine shelf would use the stainless steel with the glossy finish, there would be doors and tempered glass which makes the whole product looks fashion and modern. People can see the red wines displayed directly through the transparent glass, the wines can be put in several positions and angels, it can be put vertically, horizontally or slantly. Also the surface finishing technology is very developed now; especially the electro plating on stainless steel can have the vivid lovely colors. All of these features make the metal wine rack look modern and suitable to use in the modern hotels and restaurants. Besides, some high requirements of the wine displaying and storage can be only achieved on the metal wine rack. For example, some red wines need to be stored in the environment of constant temperature and humidity to have the best taste. The metal wine rack has the better sealing property and more suitable to assemble the equipment of constant temp and humidity.